Maya is stylish, so why not this similar-sounding name from Greek myth? 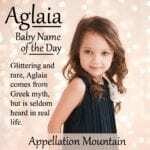 Thanks to Liann for suggesting Gaia as our Baby Name of the Day. Before there was Zeus and Hera and the better-known Olympians, the Titans were the gods in charge. And before the Titans came Gaia, the original earth mother. She created the heavens and the oceans, and with the heavens, gave birth to the Titans. She mothered a race of giants, too. 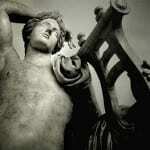 She was also responsible for saving Zeus, her grandson, from his Titan father, Cronus. Zeus, in turn, claimed the throne for himself. The name is often used as a synonym for the earth itself, sometimes spelled Gaea, as in Pangaea, the supercontinent from prehistory. The goddess is a popular figure in neopagan traditions, too. This name fits right in with popular nature choices, somewhere between vintage Lily and Rose, and modern River and Willow. The name rhymes with Maya, with a hard G sound: Guy-uh. Or that’s the most common pronunciation. Pangaea is different, of course – the gaea rhymes with Mia. So I wouldn’t be stunned to meet someone who pronounces this name like Gia. Like many a mythological name, Gaia begins on the fringes. It’s used for video game characters and in Marvel Comics, for a minor character in the extended X-Men universe. In the 1990s, Captain Planet and the Planeteers was an environmentally-themed children’s series. The Planeteers were five children from around the world, chosen by the earth itself – called Gaia – to save the day. When the Planeteers came up short, they called in Captain Planet to resolve the difficulties. A character in HBO’s original series Rome. She’s played by the gorgeous Zuleikha Robinson. Her character isn’t very nice, though like any HBO original series, it’s complicated. Francine Pascal, creator of wildly popular YA series Sweet Valley High, later created a character by the name, star of a 36-book series called Fearless. The first book was published in 1999. She’s a superhero, Alias-esque kind of character. JK Rowling – that namer extraordinaire – gave it to a young character in The Casual Vacancy. A version of the earth goddess herself makes an appearance in several of the Percy Jackson novels. The name was first given to more than five girls in 1980, when six newborn Gaias arrived in the US. It’s a celebrity baby name. In 1999, Emma Thompson welcomed daughter Gaia Romilly. And Dania Ramirez gave the name to a daughter in 2013. 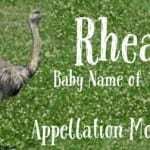 Thompson cited the ecological appeal of the name, and chances are that it’s another reason the name appeals to some parents. In 2014, 70 girls were given the name. In 2012, the number was 74. It’s a name on the edges, neither slipping nor gaining. This makes Gaia a great choice for parents after something feminine, rare, rooted – in this case, in both history and the natural world! – and with an on-trend sound. Do you think Gaia could catch on in 2016? 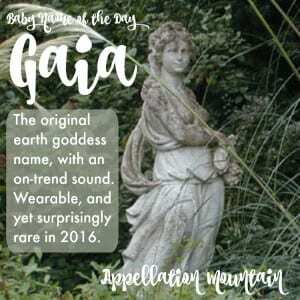 “Gaea” spelling is also an indication that the name would be pronounced Guy-ee-ah. 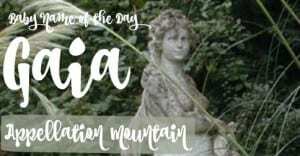 We often hear this with other Greek names like, Theadocia and Venetia. I know an infant Gaia with a big sis named Luna. Not my favorite but it makes sense for the very nature-y family. I’ve been reading the Heroes of Olympus books, where Gaea is the main villain, trying to destroy the entire earth, so it is not sounding great to me right now!! One of my favourites! 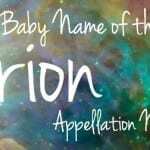 I love goddess names and this is one of the strongest. I always thought it was Gay-uh which sounds dated to me (like Gail or Gaylee). I definitely like it, but doubt it will soar in popularity anytime soon.